HELLO FRIENDS, ACCCORDING TO ME ALL LISTEN THE NAME OF PIZZA HUT, SO TODAY I M GIVING YOU A COMPLETE OVERVIOW OF THIS COMPANY THROUGH MY ARTICLE. Pizza hut is the largest pizza Restaurant Company in the world. It has 12000 outlets in 90 countries employing more than 3 lakh people. The legacy of pizza hut began in 1958. In India there are not much outlets, out of 10 86 countries India is one of them but only in 9 cities pizza hut has its outlets. The data written below represent what Pizza hut is all about and gives a brief profile of the company. "Customer are the reason that we are here." Employees are our secret ingredients. Satisfied, capable teams create satisfied customers. Its all about you and all about customers i.e. customer creation and customer retention through customer satisfaction, its all about team spirit, team spirit in order to attain good results. The employee are not allowed to make or receive personal telephone calls at work unless in an emergency. The restaurant has limited telephone lines, by keeping the telephone occupied, we may be denying customer access to us and he may call the competition instead. This is the extent they go to be with their customer. "Whenever anybody thinks about pizza hut we want him or her to smile and say "yum". "WE SUCEED BECAUSE WE KNOW HOW TO WORK TOGETHER "
"How we work together principles"
They listen and respond to the voice of the customer. They believe in people, trust in positive intentions, encourage ideas from everyone and actively develop a workforce that is diverse in style and background. They find reasons to celebrate the achievements of others and fun doing it. They do what they say they are accountable, they act like owners. They take pride in their work and have a passion for excellence. They execute with positive energy and intensity. They hate bureaucracy and all the nonsense that comes with it. They practice team together and team apart. "What influences a customer decision to a restaurant? Solve problem before it actually becomes a complaint. Treat the customer, as you want to be treated. Thanks to the popularity of Pizza Hut, the hot-spot Italian food joint in Sector 26, small-time vendors engaged in selling chholas outside the joint are also managing a roaring business. Interestingly, where earlier about three vendors used to compete for winning over customers outside the restaurant, now there is monopoly of just one vendor. Visit the Pizza Hut any time after 8 p.m. and you will find this chhola vendor a little too caught up to even talk. Most of his clients are the ones who have to wait in line outside on account of lack of space inside the joint. The greatest days for business are Saturday and Sunday, for these are the days of maximum rush at Pizza Hut. Ask the man how he feels with so much easy money, “Kya sahib, ye to sab is pizza hut ka kamaal hai. Varna hamare paas kaun aata hai.” Interestingly, this vendor has obtained formal permission from Pizza Hut people to park his small makeshift stall outside the joint. Pizza Hut gift certificates make a great gift for your family and friends! Available in $5 increments through gift certificates.com , they’re sure to bring a smile to the face of your favorite pizza lover. Reward your employees or customers with their favorite Pizza Hut® pizza through Pizza Hut Gift Certificates. Corporate Rewards provide an ideal way to include America's favorite pizza in your recognition or promotional programs. Why send a note, when you can send a party? Send Pizza Hut pizza parties to multiple locations across the country to thank your employees for working overtime, or helping to build new product launch excitement in your sales office. No matter what the occasion, Pizza Hut can help you coordinate all the details. Pankaj Batra, senior manager marketing, Indian sub-continent, Tricon Restaurants International concluded: "We are confidant that due to our best pizzas, experience and competitive prices”. Tricon Restaurants International runs the world’s largest restaurant chain under the brand name Pizza Hut numbering around 30,417 across the world and operates in 84 countries and territories throughout the World under this name whixh now when taken by the customers brings a feeling of yum in their mouth. 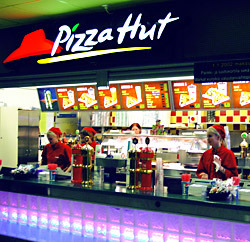 Pizza hut Features a variety of Pizza with different toppings as well as pastas salads sandwiches and other food items and beverages . The distinctive décor feature a bright red roof. Tricon Restaurants International runs the world’s largest restaurant chain under the brand name Pizza Hut numbering around 30,417 across the world. In India, one of the company’s mission is to provide competitive advantage to every supply chain management system participant by operating a world class supply chain that delivers lowest sustainable cost and continuity of quality supply. Pizza Hut’s Indian experiment was based on local realities. With high import duties, the company has resorted to massive localization of equipment and other things. As the Indian rupee is depreciating against the US dollar continuously, the company has chosen the more stable Australian dollar as the favored currency. The company had also faced obstacles in the form of high duties and procedural delays. Another problem confronted by Pizza Hut is the lack of efficient cold chains in the country. The company surmounted this problem by reducing its dependency on cold chains besides setting up its own infrastructure. These measures have yielded rich dividends. The company managed to reduce food cost by 40 per cent, equipment cost by 30 per cent, distribution cost by 40 per cent and inventory by 50 per cent. After researching the market, Pizza hut has opened its first vegetarian restaurant in Ahmedabad, Gujarat. The restaurant is a 120-seater dine-in restaurant. The market research revealed that 80 per cent of the people in Ahmedabad prefer vegetarian meals as a dining option. Thus Pizza Hut decided to launch the vegetarian restaurant to cater to the needs of the citizens of Ahmedabad, , franchisee of Pizza Hut in Ahmedabad. The research also revealed that 37 per cent of the people of Ahmedabad prefer Jain meals (Jain food is not only vegetarian but devoid of roots and bulbs like onions, garlic, ginger, potatoes.) Therefore keeping this in mind, the restaurant will offer a choice of six Jain pizzas, Jain French bread, baked fresh with special herbs and a pre-mixed peanut celery pineapple salad. Pizza Hut has taken care to make special sauces which do not contain any garlic or onion. The Pizza Hut restaurant has planned to offer a wide choices of vegetarian pizzas, vegetarian pastas, steaming tomato and mulligatawny soup, crunchy French bread, fresh salads in their world famous salad bar and delicious desserts. Pankaj Batra, senior manager marketing, Indian sub-continent, Tricon Restaurants International concluded: "We are confident that due to our best pizzas, experience and competitive prices, this restaurant will soon become Ahmedabad's favoured dining destination." Pizza Hut is planning to open 30 more restaurants in India by 2001.with Pizzeria Pure Foods Restaurants Pvt Ltd, a franchisee of Pizza Hut, has planned this while launching the second restaurant of Pizza Hut in Pune's M G Road. Pizza Hut, a division of Tricon Restaurants International, is the world's largest pizza chain. Pizza Hut has, so far, set up 18 restaurants in nine cities across the country. The third Pizza Hut restaurants would soon be coming up in Pune in two months time. Pizza Hut's expansion was indicative of the acceptance of the concept of pizza as a cuisine option in India. The first Pizza Hut restaurant in Pune had received a good response, and was serving 500 to 600 pizzas per day to around 1,200 people per day. A similar turnout is expected at the second restaurant also. The second restaurant seats 105 persons. The 4000 sq. ft. restaurant is a two-floor affair with an exclusive play zone for kids. AFTER Dominos launched its popular ``Hungry Kya??'' campaign almost a year ago, it is now Pizza Hut's turn to hit the television medium with its maiden TV campaign which says ``Good times start with great pizzas'' whichi has become a very popular advertisement in the Indian television and they have already got positive response front his ad campaign they have launched after so many years of coming in the Indian market. Pizza Hut, recently opened its restaurant in Pune. The 105 seater stylish dine-in restaurant with a floor area of 4000 square feet, has the same ambience as that of any Pizza Hut restaurant, across the world and offers pizzas served in an ambience centered on fun, relaxed informality, entertainment and friendly service. The restaurant boasts of a very contemporary design, split level seating, a high ceiling and aesthetic Pizza Hut murals. The new restaurant has a colourful kids play zone. It also has the new Pizza Hut signage, which gives the place a very contemporary look. Pizza Hut has an aggressive expansion plan for India. It intends to have 100 outlets by the end of 2004. Pizza Hut will consolidate its presence in cities where it is already existing as an endeavor to create a major share of these profitable markets first before spreading to other markets. “We currently have 19 stores across 10 cities including Mumbai, Delhi, Bangalore, Chennai, Ahmedabad, Hyderabad, Pune, Chandigarh, Agra and Jaipur. By the end of this year we will scale it up to 35 stores. In Mumbai alone we plan to have five stores by the end of the year. We want to become the most preferred pizza brand by offering great tasting pizzas for all the usage occasions at our place (table service) as well as yours (home service)” stated Pankaj Batra, marketing director Indian sub-continent, Tricon restaurants. Pizza Hut has more than 12,500 units across 90 countries making it one of the largest pizza brands. Further, all new outlets in India would be franchisee owned resulting from the smooth functioning of the existing stores which are all franchisee owned. Hence, the same arrangement will be followed in the future to ensure growth-oriented results.